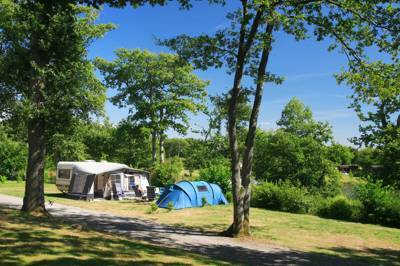 A spacious pitch with electricity and water, set in the peaceful, lakeside camping meadow in the grounds of a classic 19th-century Breton château. A spacious pick with an electricla hook-up, set in the peaceful, lakeside camping meadow on the grounds of a classic 19th-century Breton château. 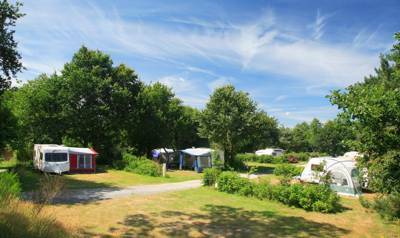 A super-spacious grass pitch with water, electricity and waste disposal, in the peaceful, lakeside campground in the grounds of a classic 19th-century Breton château. How many of you have harboured dreams of staying in your own French country estate? Well, look no further than Camping Deffay. This peaceful, lakeside park lies in the sprawling grounds of a classic 19th century Breton château, four kilometres outside the pretty commune of Pontchâteau. In the heart of the Brière national park, Camping Deffay makes its name as a central base for exploring some 154 acres of marshland lakes and islets. The region feels, in many ways, like one of France's last great wildernesses. That is until you marvel at the many thatched cottages which adorn the reed-lined waterways, and realise that the Brière is in fact a living snapshot of Brittany's rural history. 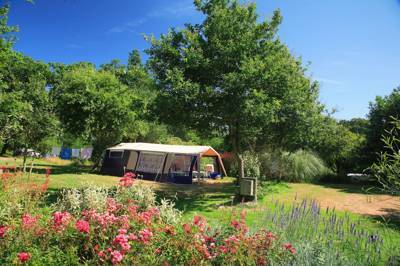 Besides the park, Camping Deffay offers the ideal position for exploring the many delights of western France. From the vineyards of the Loire Valley, to the glitzy beachside bars at La Baule; from the medieval citadels of Guérande, to the vibrant Grand-Ouest capital of Nantes; Deffay is equidistant from any number of great days out. But if a good old dose of r'n'r is paramount on your agenda, then you rarely need to leave this laid-back, lakeside hideaway. With brand-new wash facilities worthy of its four-star status, a cheap and cheerful campsite bistro and bar, plus delightful multi-lingual staff that are only too happy to help, this really is fuss-free camping. The real draw here, though (and providing a handy division between the site's camping area and the smattering of statics and bungalows on site), is the lake. Guests are allowed to fish the waters and take the campsite pedalo out for a cruise, while flat, well-drained pitches sit right along the shoreline. You'd be hard pressed to find a more idyllic spot to pitch. Oh, and keep your eyes peeled for the family of resident coypus on the lake's small island. You'll generally hear them before you see them, providing a soft, calling soundtrack to this quiet camping retreat. This peaceful, lakeside park lies in the sprawling green grounds of a classic 19th century Breton château. 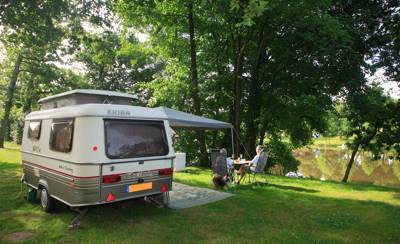 For latest availability and best prices for Camping Le Deffay, please use the Date Search above. 150 (90 for touring units) pitches, most with electricity (6 or 10 amp). Lakeside spots available. The lake nicely divides the tent camping area from the larger touring vehicles and static caravans. Wash block with decent toilets and showers. Washing machines, dryers and even a dish-washer available. Wi-Fi for €3 per day. Open-air swimming pool. Small onsite shop stocking basics such as croissants, bread, etc. The Parc Regional de la Grande Briere (0033 240 91 68 68) boasts the Loire Valley's most diverse wetland bird population. Explore France's second largest marshland on a leisurely cruise in one of the iconic punts, or chalands. Or, if its beaches you're after, La Baule-Escoublac is regarded as one of Europe's finest bays. This south Breton resort is famous for its pristine 12km sands which attract the French upper crust every summer. Besides its casinos and luxury villas, La Baule also hosts one of the world's most prestigious show-jumping events, Grand Prix de la Ville de La Baule. The port of Saint-Nazaire is also close by – the scene for arguably the most daring allied raid of WWII, when British commandos ram-raided and destroyed the dry dock there. Some of Brittany's most historic towns and cities are also worth a visit including Nantes – home of the Château des ducs de Bretagne (0033 251 17 49 48) – and Vannes with its ancient city walls and timber-beamed houses. There are plenty of excellent restaurants in the area. Le Clos de Mélanie (0033 240 88 08 39) is one of the closest and serves a pleasing menu of French classics. For something particularly sophisticated, Le 11 (0033 240 42 23 28) offers a vibrant set menu and they also have an artisan shop attached. Deffay's onsite eaterie is also a decent and convenient shout, though it only opens in high season from 7pm-10pm. The pizzas are particularly popular. From €18.00 – €23.00 for an electric pitch and 2 people. From the N165 join the D33 at junction 13. Then follow blur tourist signs for Camping du Deffay. Nantes Airport is 50km away. Rennes is around 100km.